Luton chief Nathan Jones faces a tough call as to who he will pick to start upfront alongside Danny Hylton at Coventry City tomorrow night. With James Collins suspended, Elliot Lee came into the side against Accrington on Saturday and scored on his first appearance since being injured against Wycombe on January 30. That’s what we want though, we want those conundrums, we want that competition for places. However, Collins had notched four times in his previous four games until seeing red at Cambridge United, as Jones said: “It was a real bonus his (Lee’s) performance and getting the goal. “He had a number of opportunities and looked dangerous all afternoon. “It was surprising he didn’t get more than one, as he had another three opportunities when he cut inside on that right foot and he’s normally deadly with it. “He put one into the keeper’s hands a couple wide or over the bar, so he showed what a threat he is. “We’re delighted to have him back as we haven’t seen him since Wycombe and he has been a miss for the squad, he really has. “That’s what we want though, we want those conundrums, we want that competition for places. “The trouble is we haven’t had that lately, we’ve had people injured. “(Scott) Cuthbert’s been out, (Alan) McCormack’s been out, (Johnny) Mullins has been out, Elliot Lee’s been out, (Danny) Hylton’s been out, (Harry) Cornick’s been out, so we haven’t had that. 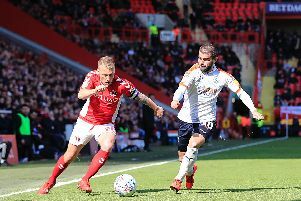 With Cuthbert on the bench and Luton going five games without keeping a clean sheet, when asked if either he or McCormack could come back in to add some experience to Town’s ranks at the Ricoh Arena, Jones added: “I think everyone’s in contention and Scotty is a good experienced one, we’ve missed that in recent weeks. “In the early part, we still kept the momentum going and we won games, regardless of who we were playing at centre half. “People like Mullins came in and did fantastically well and Glen Rea, but we’ve missed that leadership, of course we have.